The Crysbro Group reputed for quality, freshness innovation in breeding, processing and packaging chicken in Sri Lanka and expanding island wide with more commercial poultry and agricultural activities conducted its employee welfare program Sisu Diriya CSR for the fifth consecutive year recently. The Sisu Diriya CSR manoeuvred under the guidance and direction of the Crysbro HR Team is considered as one of the most intimate and motivating events by the workforce which has won the hearts and minds of all Crysbro Group employees on top of all other welfare initiatives in the calendar year and is held with much grandeur and might by the workforce. The Crysbro HR Team with the passage of time has introduced much needed innovation to the CSR making it a more beneficial and memorable event for its employees introducing new fascinating and valuable features such as providing plants along with books and introducing poetry and art competitions and adding many more educational items each year. Furthermore, more variety was introduced in the CSR in 2016 with a poetry competition for Cryesbro employees and an art competition for the children of employees added and held under the topic ‘Let’s Protect the Environment’. The hidden talents and special abilities of Crysbro employees were recognised and rewarded with expensive gift vouchers at the CSR event. The victorious poems and drawings and other selected poems and arts were also printed in the first page of each book which was very much cherished by the employees. Crysbro Staff students were also presented with Rs. 1,000 worth of a gift voucher to purchase whatever they want from DSI along with the pack of books. The Crysbro Employee Welfare Society allocated Rs. 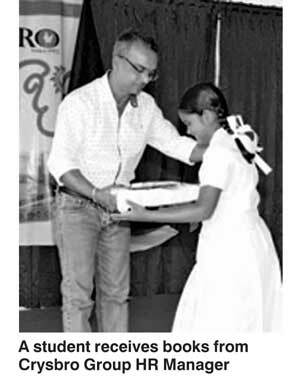 660,000 for the unique CSR initiative which ended in high note with Crysbro staff children who passed the Grade5 scholarship exam 2016 being gifted with Rs. 10,000 each, also funded by the Crysbro Employee Welfare Society. The Group conducts several unique CSRs and has implement several distinct aspects to CSR, in which each part has been separately recognised to ensure proper focus, maximum coverage, inclusion, accountability and transparency in their execution. The inimitable CSR ‘Diri Saviya’ focuses on providing income avenues for contract breeders and contract farmers. Contract breeders, who raise chickens on behalf of Crysbro, are provided with chicks, feed, technological inputs and advice on breeding, in addition to the purchase of fully-grown poultry at guaranteed prices. This CSR has resulted in uplifting the lives of hundreds of contract breeders and their families, in addition to empowering numerous women who have joined it in order to improve their living standards. Crysbro has conducted reward initiatives to accolade and reward its outstanding contract breeders in all regions of its operations. 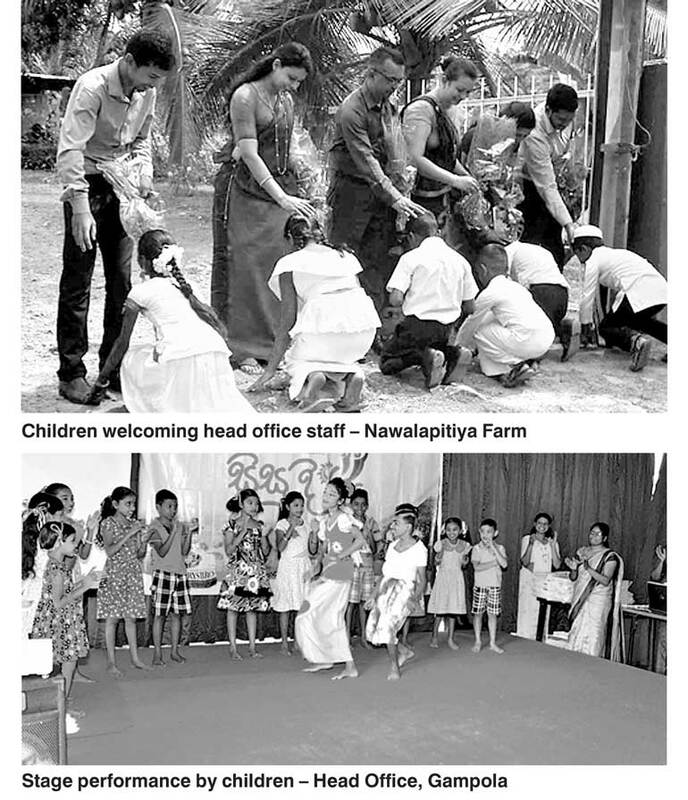 At the award ceremonies conducted in the Central and other regions, winners and their families were granted fully paid Buddhist pilgrimages to India, while others received valuable prizes and mementoes. Contract farmers in identified areas, who cultivate rice, maize and other grains, are provided seed grain, fertiliser and technical assistance, while being assured of guaranteed prices for their produce. Grain produced by these farmers is used to produce chicken feed at Crysbro’s state-of-the-art feed mill plant at Warakapola in the Kurunegala district. The Crysbro Group, along with its subsidiaries Midland Breeders Ltd., Golden Grains Ltd. and Wayamba Development Ltd., have provided direct employment opportunities for over 800 individuals living in most parts of the country. Furthermore, thousands of farmer families from Central, North-Central, Eastern and Uva Provinces have benefited from Crysbro’s out-grower projects which silently contribute towards the development of the country. Farm’s Pride Ltd. are the producers of Crysbro Broiler Chicken, whose facilities consist of the Broiler Production Farms at Pupuressa, Broiler Production out-grower programs launched in Central, North Central, Eastern and Uva provinces and the state-of-the-art Processing and Packing Unit situated at Athgala, Gampola.